Pretty much every decent fantasy book I’ve ever read has included a map of some sort (the exception being Urban Fantasy of course). Seeing as I consider my own work to be at least "decent" as well, I knew I had to include a map of the world events happen in at some point. 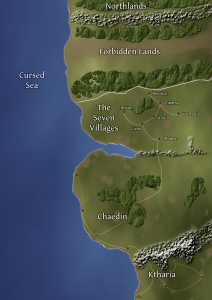 Thanks to an awesome tutorial by RobA at the Cartographer’s Guild and several hours spent with GIMP, I have created a somewhat acceptable world map to share with you. Of course, it would have been a lot faster for me to use Campaign Cartographer (for which I have a license), but I can’t use any image created with that for commercial purposes (which includes books).